In 2014 I made a trip to Aspen, Colorado with my daughter, son-in-law, and granddaughter. It was my granddaughter’s first trip to real snow and 2014 was a banner year for snow in Colorado. While her parents skied, I got to play with granddaughter. One of the photos that I took during that trip became the basis for one of my favorite art quilts, “JOY!”. After applying some filters for special effects in Photoshop, the image was digitally printed on cotton for me by Red Dog Enterprises. I then used appliqué, hand stitching, and machine quilting to complete my project. “JOY!” has been creating quite a bit of joy for me recently. It was included in the Spring 2015 issue of the SAQA Journal. A few weeks ago I was notified that “JOY!” had been juried into the upcoming Sacred Threads exhibit in the Washington, DC area in July. Finally, this week I learned that “JOY!” has also been selected to be part of the Sacred Threads Traveling Exhibit. 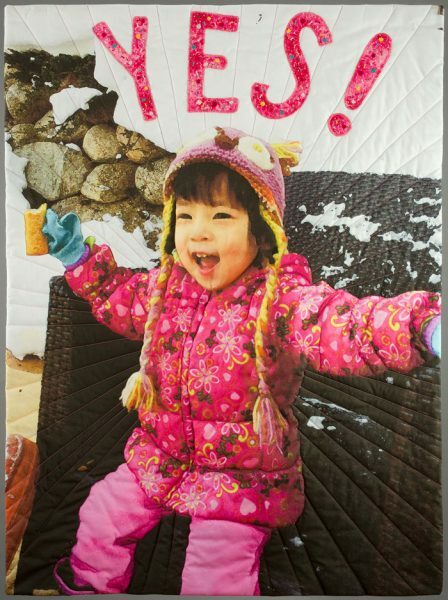 Needless to say, I feel as joyful as my granddaughter pictured in the art quilt. I hope that you will have the opportunity to see “JOY!” during its travels over the next two years. Congratulations on all fronts, Judy! Missed you big time in Portland…but am determined to visit when you are finally settled in Spokane area! Hugs to you and yours — especially your bundle of joy! The image exudes joy just like your granddaughter and the way you feel about her. Congratulations- lots of people will get to feel joy when they see your artwork! I absolutely love this artwork! One of the things I struggle with is what pattern of quilting lines to use and those lines radiating out from her are just perfect to celebrate her joy. And how wonderful that it was chosen to travel. Congratulations. A wonderful piece. Congratulations on the Sacred Threads acceptance… to share it with so many others as they view the exhibit is terrific! how wonderful for you…very well deserved Judy. Your little girl is adorable…..a grand daughter to cuddle constantly! !